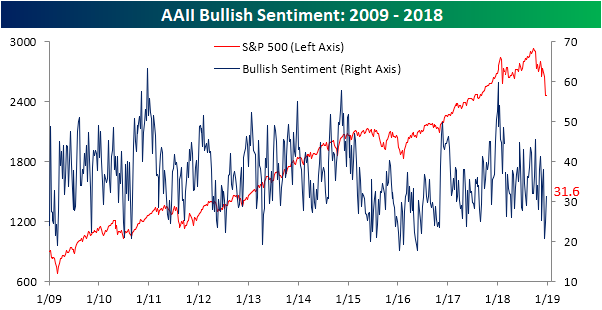 In spite of major declines in the past week, bullish sentiment through the AAII survey of individual investors actually rose for the second week in a row to 31.6%. That is up from the very low 24.9% reading from last week and an even lower 20.9% the prior week. Turning to bearish sentiment, this week’s readings are similar to what we anticipated from last week’s release. As we previously mentioned, due to the timing of the survey, the heavy losses following the FOMC’s rate decision and Fed Chair Powell’s press conference did not likely fully come into play. That is not the case this week, and after continued weakness right up until Christmas Eve, it comes as no surprise that bearish sentiment jumped to just above 50%, completely overtaking last week’s small downtick. 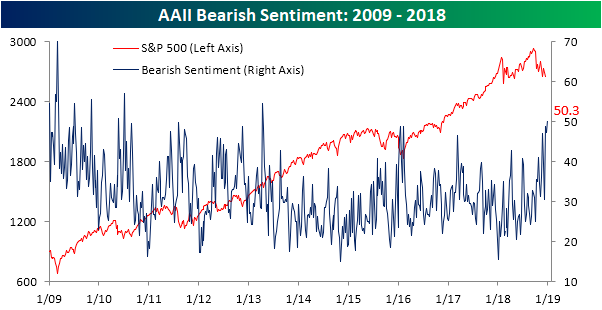 Bearish sentiment has remained at elevated levels for some time now, but the last time investors were this pessimistic was back in April 2013. 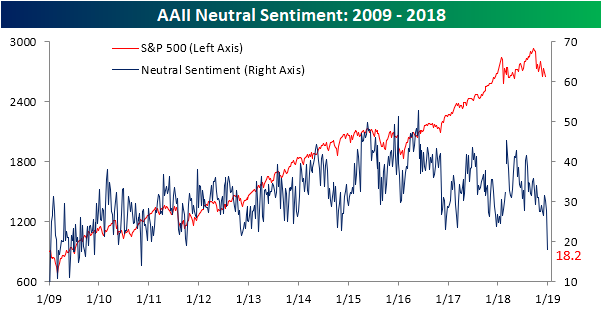 With both Bullish and Bearish sentiment increasing, Neutral sentiment fell significantly. The current reading is down 9.7% from last week to a multi-year low of 18.2%. The last time that neutral sentiment was this low was back in November 2010. God help us! Praying for a turnaround before my retirement is wiped out!